The smart camera continues to divide opinion: some see it as ideal for just about every application, while others consider it expensive and too complex to program for many smallscale applications. ‘Smart cameras are well established and have been around for some time,’ says Fabio Perelli of Matrox Imaging. For some, this means they are not as exciting as newer technologies, such as GigE Vision, but with more and more companies adding smart cameras to their portfolio, it is a market that still has growth ahead of it. A smart camera differs from any other in that it a certain amount of image processing takes place on board the camera. Once the image has been processed, data can be sent to a thirdparty device (such as a PC) or a decision can be sent elsewhere (e.g. a ‘shut-down’ message to machinery in the event that a faulty product has been found. ‘The biggest advantage of smart cameras is obviously that it is a true standalone product,’ says Basler’s Henning Tiarks. ‘There is no need to have a PC nearby, or even to be connected to a PC at all. For example, a customer could install a camera within some machinery on a production line, having programmed it to check for defects on products that pass its field of view. If it spots a defect, the camera can tell the machine immediately and shut down the machine automatically, without any need for a PC or further user intervention. This makes smart cameras particularly useful for large production plants that would otherwise require huge lengths of cable to link units back to a central PC, or for locations where using a PC is unsuitable. 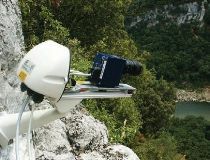 A smart camera from Matrix Vision is used in the Ardeche region of France to help with traffic management on the Ardeche and Sorgue rivers. The camera supports the boat rental companies in managing the departure times of boat groups, as well as offering general monitoring of the river. With processing taking place on board the camera, one of the biggest advantages of a smart device is that it reduces the amount of data that needs to be transmitted. ‘The limits of what a smart camera can do are governed by the power of the CPU on board and also by how much data needs to collected,’ says Matrox’s Perelli. ‘Applications such as web inspection, where huge amounts of data need to be processed, are not suited to smart cameras. Some smart camera models might have issues with heat dissipation around the processor, but Intel is working on methods of reducing power consumption and, therefore, the associated heat problem. Firstsight Vision’s Mark Williamson sounds a warning against smart cameras being the answer to everything though. ‘There is a perception that smart cameras are simple units that reduce cost,’ he says. ‘While that can be the case, it is not universally true. The reality is that many so-called smart cameras do not have an I/O output capable of coping with a reject mechanism. In such cases, a separate breakout box is required – and this drives up the cost and wipes out any savings that have been made by having the processing on board. The SmartSurv surveillance system, featuring a camera supplied by Matrix Vision, is shown here in a care home. The smart camera recognises and classifies activity – for example, if a person falls in a corridor, it will only alert nursing staff is the person does not then stand up. ‘An upcoming application for smart cameras is traffic surveillance, including automatic number plate recognition,’ says Matrix Vision’s Bleise. ‘The applications is particularly suitable as it requires independent units, which can then drive peripheral technologies, such as lighting or a display to warn drivers to slow down, for example. Also, as traffic surveillance often requires copies of the same programmed camera in several different locations, the smart camera provides the perfect answer. While smart cameras do have several advantages and numerous potential applications, it would appear to be vitally important that a customer has their eyes open to the limitations of what a smart camera can achieve, before assuming that it will provide all the answers – and the cost-savings – they hope for.